Hello! Welcome to Day 3, the last day of our fun fall release blog hop. The hop will run for 3 days (10/24/16 - 10/26/16) with a list of participants on the Impression Obsession Blog each day at 6am EST. Visit our fabulous IO Design Team’s blogs (only one comment per blog per day please) for a chance to win one of THREE $25 Gift Certificates! The more designer blogs you visit and leave a comment on the better chance you will have to win!!! I have a couple of shares for you! That's because the dies are all so yummy and I can't seem to stop creating with them! My first card is quite simple. 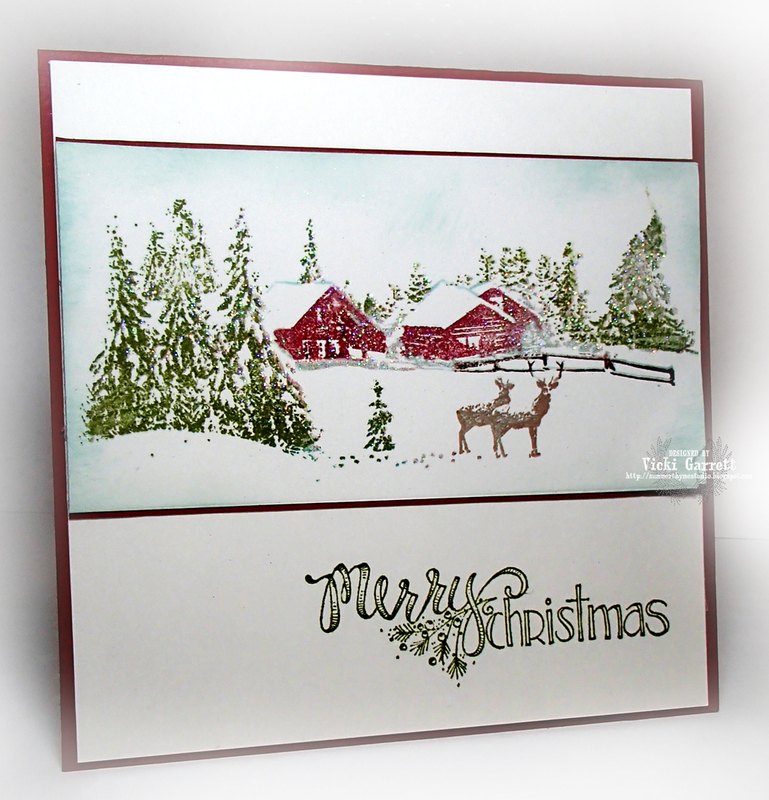 It uses the Sleigh Scene Die as the main focal point. Cut in White, Mounted on foam tape over teal ad with a splash of glitter to add some Pizzazle!!!! Yep Pizzazle is my new word for the day!!! The Wrought Iron Fence Die is definitely worth a second share as I think it's my fave for this release. I had it all spooked out yesterday, but today I wanted a bit of a fairytaleish look. 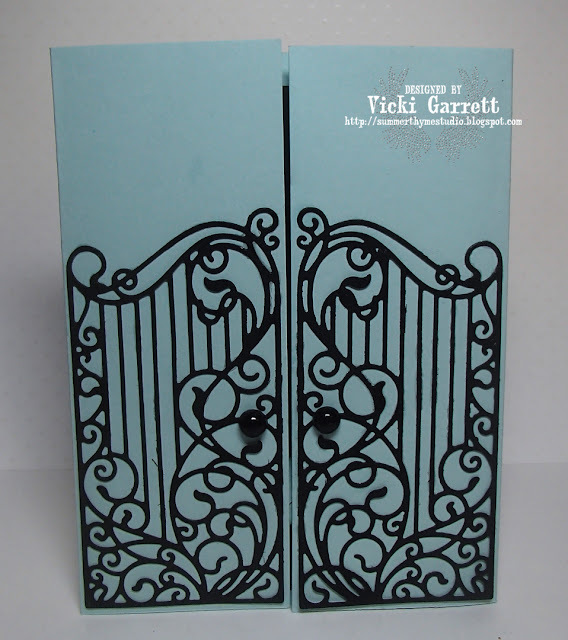 Sooooo I left a full card front in Sky blue and mounted the fence on top, adding a couple of pearl gate handles...(not to be mistaken with pearly gates) Actually this die is rather heavenly and it would look lovely in gold, mounted atop a mass of clouds!!! and of course me, but you are already here!!! Thanks for all the Love this week. Knowing my cards make you smile, makes me smile! 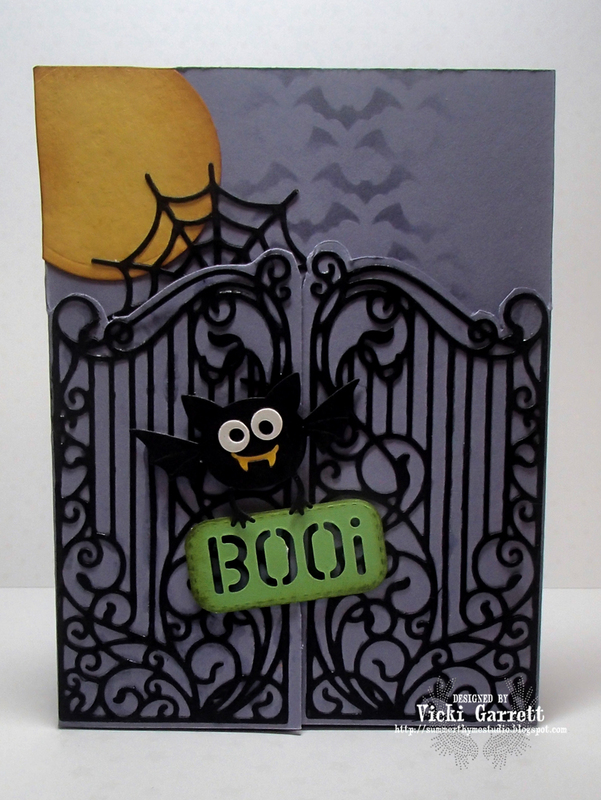 Impression Obsession Fall Die release Blog Hop day two-Spooky Stuff! I cut a golden moon with a spellbinders circle die and sponged it up a bit. 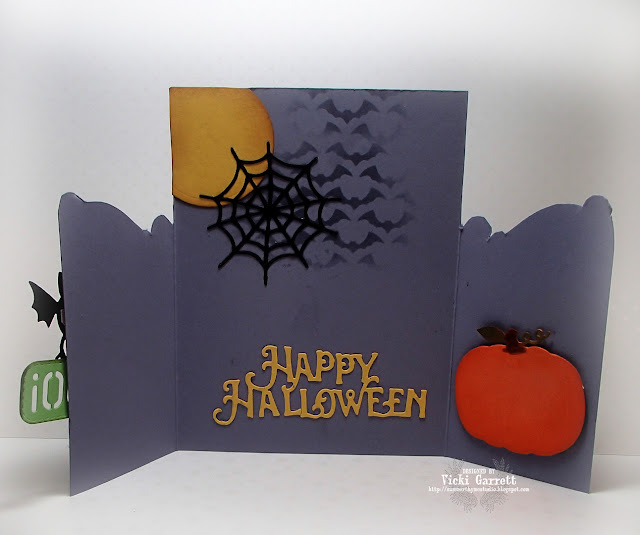 To spookify it just a little more, I used a Tim Holtz Stencil to add some bats and mounted a Spider Web on the Moon. and a Pumpkin Die. for good measure! Be sure to check out the designer blogs and leave some love! The whole Team is on board today! 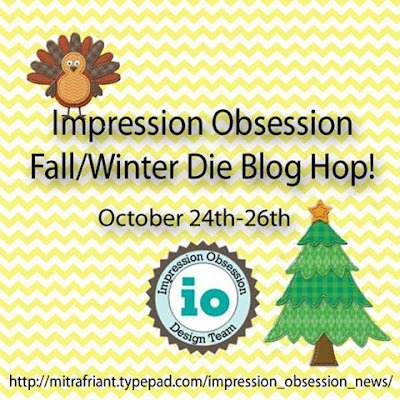 Welcome to the Impression Obsession Fall/Winter Die Blog Hop! 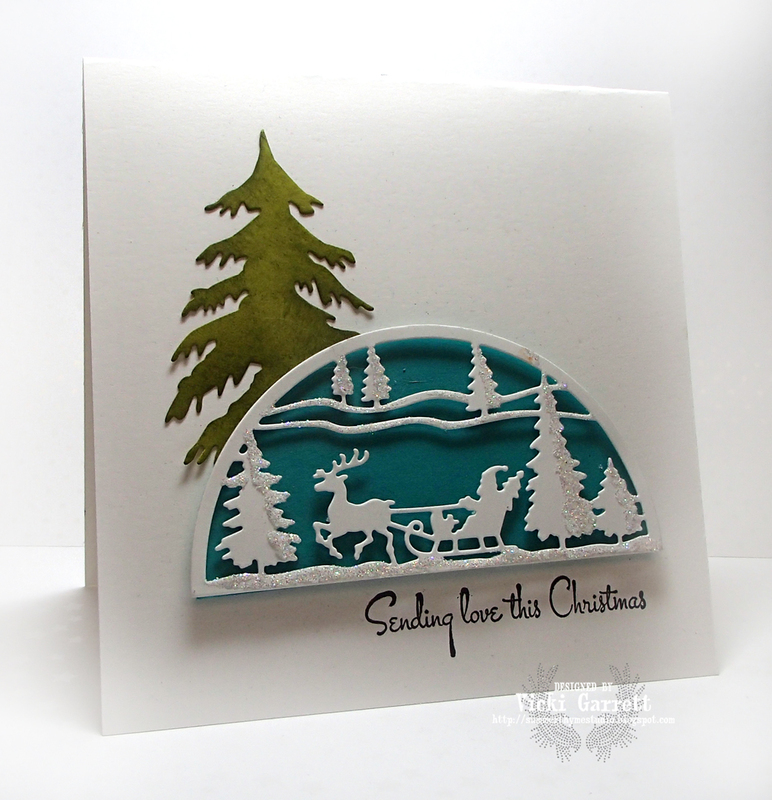 We have some beautiful new dies to share AND a Gift Certificates to give away! My Card Features the Wreath Builder Die. Can you see the different foliage in the wreath. 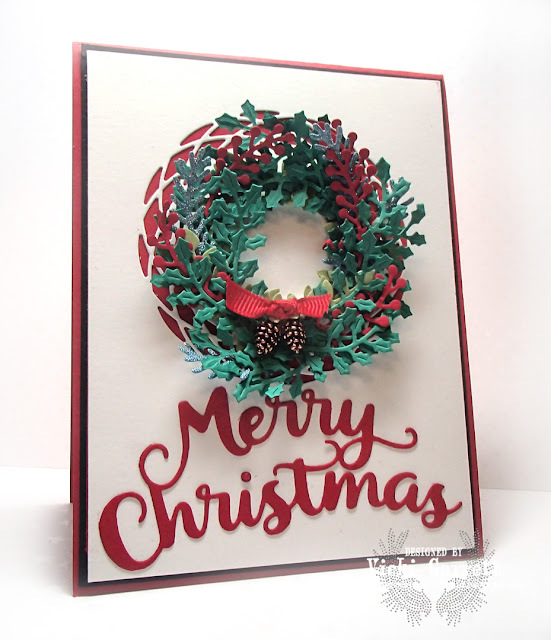 I had fun combining the different colours and building the wreath. 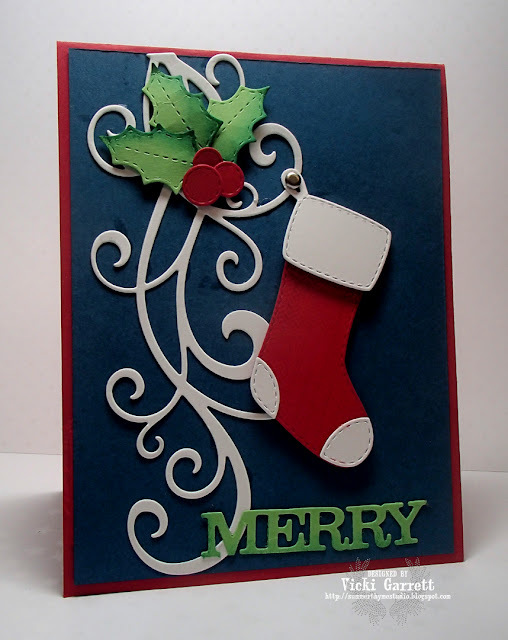 Lastly, I deconstructed this Merry Christmas Die as I only wanted the "Merry" part of the sentiment. Comment entries will be open until 9pm CT on Sunday October 30th and all winners will be announced Monday October 31st. Good luck! If you have any questions please email Jeanne. All of the new dies you'll be seeing on the hop are available NOW! Impression Obsession Designer Challenge-to die for! This weeks challenge is to use Die Cuts on your creation! I combined an older die with a new die and some fussy cutting! 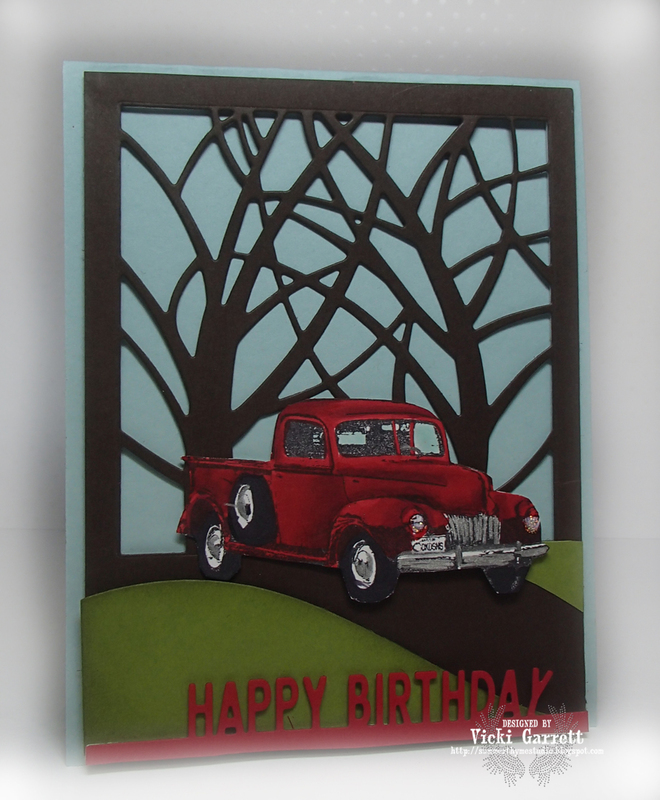 The little truck is cut out of a stamp from the Timeless Classic clear set. Be sure you head over to the IO stamps blog to load your creation, because you could win a $25.00 gift certificate just for playing!! Welcome to the Impression Obsession and My Sweet Petunia Fall Blog Hop! 3. 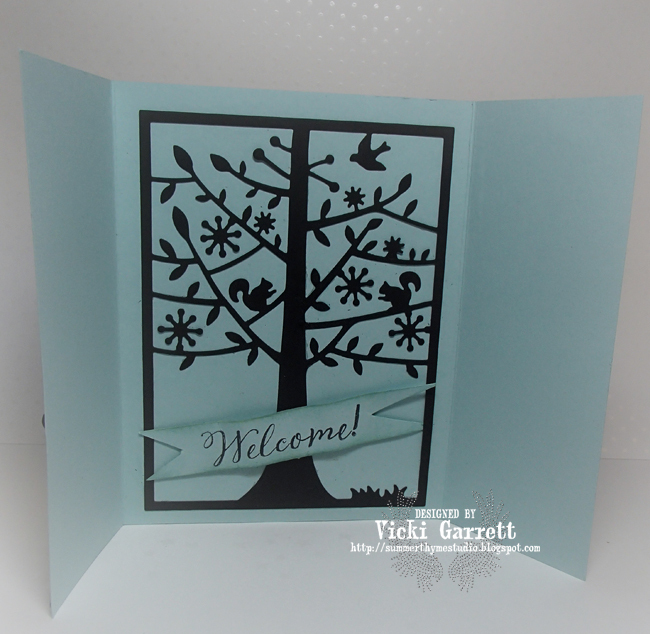 Clean the stamp with a wet wipe and Ink the trees in a lighter shade of green. 4. Reink the Trees with a Darker shade of green ( I used Old Olive). 6. Clean the stamp and using a marker, colour in the Cabins. Huff on the stamp to give added moisture and stamp on the cardstock. Add a second coat of marker if necessary. 7. Clean the stamp and using a water based marker, colour in the fence line, stamp. 8. Clean the stamp. 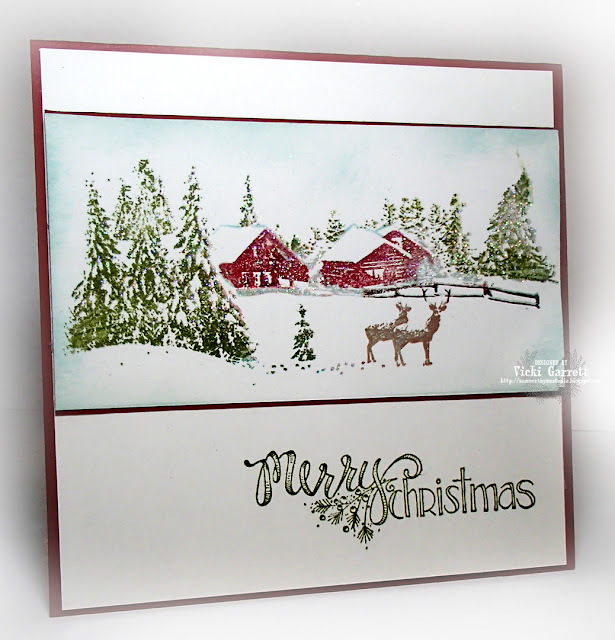 Using either a glue pad ink up the stamp quickly. Stamp and apply glitter, shaking off the excess. Alternatively paint on a thin coat of glue and seal and stamp, followed by glitter. If you do this, be sure to clean the stamp well with water. Using a Marker, pencil in the roof lines on the Cabin. 9. Stamp the Merry Christmas Sentiment in Old Olive. On Wednesday, October 12th we will draw from everyone who leaves a comment on ALL the blogs in the hop to give away a mini MISTI and a $25 IO gift certificate. Winners will be posted on the IO & MSP blogs and FB pages. Hello! I hope that you're having a great week! 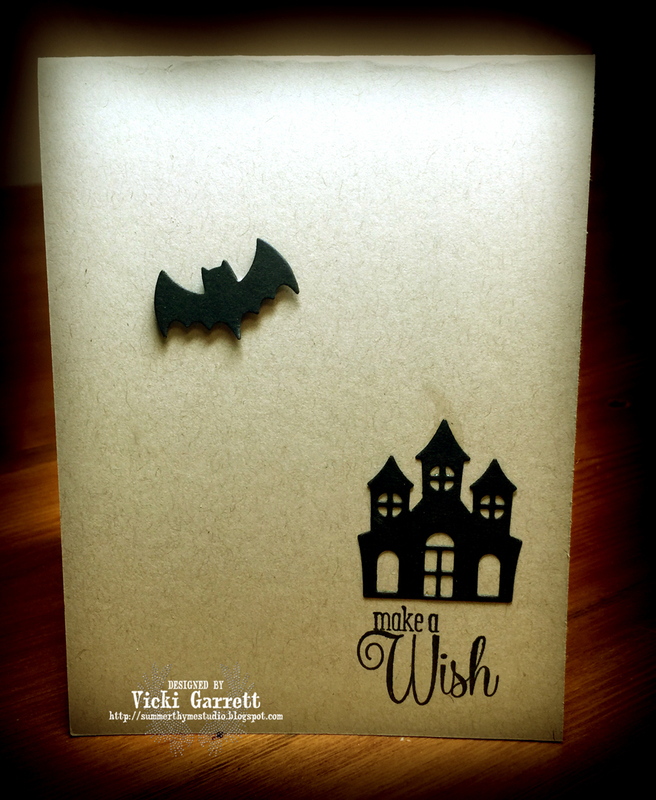 I decided to take the spooky route and make a Halloweenish Birthday Card! Quick and easy, plain and simple, but i quite like it! Check the Blog HERE for more details and to see who's playing this week!